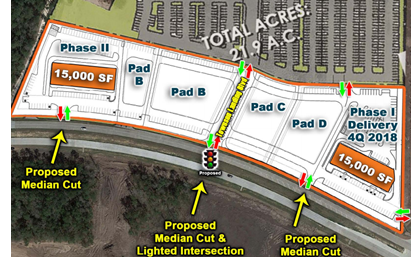 ​​​​ HUMBLE – A new eight-acre plaza, called Shops at Townsen Boulevard, is under construction behind Costco Wholesale at the intersection of US 59 and Townsen Blvd. The development will consist of two phases—two 15,000-sf shopping centers with four pad sites in between—and is expected to open during first quarter 2019.
Business will be aided by the $3.4 million expansion of Townsen Blvd. that should be completed before the end of summer 2018. A groundbreaking ceremony and pre-leasing efforts are expected to take place in July 2018.